It was a family event, a hard-pounding endurance challenge or a brisk hike up the hill. Whatever you called the 34th annual Baldy Hill Climb, the Sun Valley Ski Education Foundation event ushered in the fall season on a wonderfully mild morning after the setting of the Harvest Full Moon. 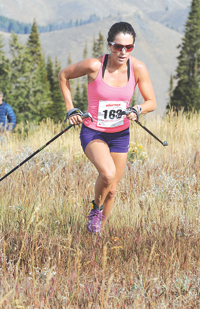 Ketchum’s Miles Fink-Debray, 24, and Maine native Lucy Garrec, 23, both ski racers, were the winners of Saturday’s Baldy Hill Climb on a 1.86-mile, 3,140 vertical foot course up the Warm Springs side of Sun Valley Resort’s principal ski mountain. The top 11 finishers broke 44 minutes in a competitive men’s race. Many of the 163 finishers who made the summit have done the event before. But there were first-time entrants. For instance, young Mikella Tobin of Boise finished her first Baldy hike in 1.18:53, just ahead of her aunt Katrin Tobin of Santa Cruz, Ca. That’s a family that has deep roots in Ketchum and Sun Valley—and of course in the Baldy climb. Mikella’s father Michael Tobin has been “Mr. Baldy Hill Climb” for most of his life since graduating from the Community School His sister Katrin Tobin, who also grew up in Ketchum, was one of the best U.S. women bicycle racers in the 1980s. She won the 1988 Ore-Ida Women’s Challenge in Idaho and was second in 1987. They reunited Saturday for the 2012 version of the Baldy Hill Climb and shared some quality time with Katrin and Michael’s mother, Rosmarie Bogner of Ketchum.